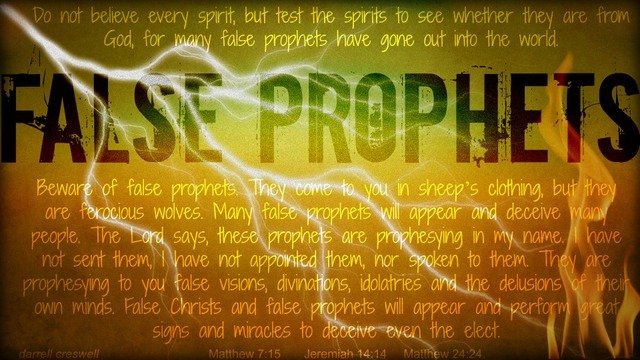 Prayers for the Week - Beware False Prophets! I’ve been running a 101-102 fever for two days now and believe I have an ear infection. If you could pray that the antibiotics work and that it’s an ear infection and not something I can pass to the rest of my family. Please pray for healing for her and that she she doesn’t pass it along to her family. Thanks everyone! My stepfather was taken back to the hospital yesterday, he had a stroke. Just got home from seeing him and I’m not sure what to think. I’m very worried for Charlie and very much so for my Mother, who has been my rock over the last few years. Their 20th anniversary is next week, I pray they get to share it together. It’s my turn to be my Mom’s rock. Please keep my family in your thoughts. Please pray healing prayers for Tim’s stepfather, and prayers for him Mom and the rest of his family as well. Pray for God’s Peace, Comfort, Strength, and Love to descend upon all of them as they strive for his health to improve. Thanks everyone! Previous Post: Happy Birthday Grandpa!